KwaZulu-Natal’s largest water board has posted positive results in its half-year reviewed interim statements, underlining its position as a high-performing and financially stable entity. Customer confidence, volume sales growth and prudent cost containment are among the key factors that contributed to Umgeni Water’s strong outcomes in the period July – December 2018. Financial Year 2017/18 closed on a high note and also marked the beginning of unprecedented growth for KwaZulu-Natal State-owned entity Umgeni Water. Umgeni Water continues to be considered a water sector leader with an impeccable record in governance, water quality, water resource management, water services provision, wastewater management and financial sustainability. This is evidenced in the number of water sector entities, from South Africa and other parts of Africa, that have visited it in recent years and benchmarked against best practices. KZN Department of Cooperative Governance and Traditional Affairs (Cogta) has broadly welcomed today's declaration of drought experienced across several provinces in South Africa as a national state of disaster by Cooperative Governance and Traditional Affairs Minister, Dr Zweli Mkhize. Leaks can waste a lot of water, especially if they are undetected or underground and left for a long time. Leaks on your property are your responsibility. So here is a guide to finding and fixing them quickly, to save water and save you money. On Tuesday, 13th February 2018, a media briefing was held at Albert Falls to illustrate the serious extent of water shortages in this dam, impact of water shortages and the consequences of failure of this dam if adequate rains are not received and if consumer behaviour does not change. The Department of Water and Sanitation is implementing the rationalisation of water services and water management institutions in line with the Institutional Reforms and Realignment (IRR) and the policy position approved by Cabinet in 2013 as published on Government Gazette Notice No. 888 on 30 August 2013. An interim Board has been appointed at Umgeni Water to begin its tenure with immediate effect. This, it is expected, will bring an end to concerns of some investors who have expressed the view that governance oversight may not be adequate as a result of dissolution of the previous Board when its term of office ended on 30th June 2017. Members of the National Assembly Standing Committee on Appropriations (SCOA) visited the uMshwathi Regional Bulk Water Supply Scheme on Thursday, 12th September 2017, to witness first-hand progress with the project. The graphs on this page are based on worst-case scenario, meaning that in the absence of rainfall and with current water restrictions of 15% remaining in place, dams are predicted to run dry on the dates shown. Even though you have pre-entered on-line, you still have to register at the Midmar Dam Resort on Saturday 11 March between 14h00 and 17h00 or Sunday 12 March between 04h30 and 06h00 and collect your Race Number and T-shirt. For the second consecutive year, Umgeni Water was selected winner in the State-Owned Enterprise category of the Nedbank - Pietermaritzburg Chamber of Business annual Business of the Year awards, held on 11th November 2016 at Royal Show Grounds. Representatives of civil society, construction companies, iLembe District Municipality, eThekwini Metro and Umgeni Water gathered to celebrate the commissioning of an upgraded Hazelmere Water Treatment Plant. South African Board of People Practice (SABPP) is the human resources professional body and statutory quality and standards body for the people profession. SABPP has developed 13 Human Resources National Standards that provide guidance on the implementation of Human Resources Management functions. Umgeni Water's largest system which supplies water to an estimated 4 million consumers in uMgungundlovu District, Pietermaritzburg, much of Durban and part of Harry Gwala District remains under stress as the drought continues its firm grip on KwaZulu-Natal. As part of the Clean Rivers Campaign initiated by the Department of Water and Sanitation, an event was held at Mthinzima Stream on 18th July 2016. An Umgeni Water team went on an important mission: to help in the process of information and education provision, as part of our commitment to assist in the protection of communities that live close to bulk water storage and treatment infrastructure. Senior Executives and Managers from Umgeni Water swopped their day jobs to clean up the Baynespruit River in Sobantu, Pietermaritzbrg, on Wednesday. The Umgeni Water group was led by Chief Executive Cyril Gamede and comprised General Manager: Operations Msizi Cele, General Manager: Corporate Services Mokete Moleko and Corporate Stakeholder Manager Shami Harichunder. They were later joined by a group of volunteers and the Councillor for the area. Greetings, sanibona, dumelang. Welcome back to my blog. The world seems to have been in a tailspin since we last interacted, and the American Presidential election campaign has had much to do with it. It is intriguing how a radical shift from Barack Obama to Donald Trump has now become a possibility in a country regarded as the custodian of freedom and liberal values. A tidal wave of right-wing sentiment seems to be squarely behind Republican Donald Trump as Americans seek alternatives to their current war psychosis. And what is the trump card that Donald believes will get him into the White House for a 4-year term? Sadly, it is an eccentric mix of populist rhetoric that is resonating with White supremacists and Nazi sympathisers. The broad vision of the National Development Plan for Water Resources and Services is that, by 2030, all South Africans will have affordable access to sufficient safe water and hygienic sanitation to live healthy and dignified lives. In September 2015, South Africa and 192 other countries committed themselves to realisation of the targets set in the Sustainable Development Goals (SDGs). For the first time, water and sanitation was adopted as a stand-alone Goal 6: Ensure availability and sustainable management of water and sanitation for all. Eyes and ears will be fixed on Minister Nomvula Mokonyane as she unpacks major water and sanitation projects during the 2016 Budget Vote. Sanibona, molweni, greetings. I am ready to take another journey with you into the wonderful world of blogging. Yes, a month has passed, although it feels as if it was only the other day that we communicated through this column. The bad news is that time flies; the good news is that youï¿½re the pilot. Keynote address presented by Vasu Gounden, Founder and Executive Director, ACCORD, at the 2016 UKZN Graduation on 11 April 2016, on receiving his honorary Doctorate of Social Sciences. Warm greetings again from the Executive and welcome back to my column. I want to begin with the SAP ERP project and progress with its implementation in the period since we last engaged through this blog a month ago. Letï¿½s first deal with non-technical matters, from a change management perspective. 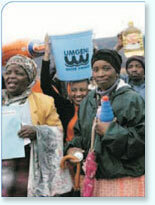 As its contribution to greening the environment, Umgeni Water teamed up with the Harry Gwala District Muncipality.